Lodges and caravans overlooking Ardmucknish bay. Beach, play area, mini golf, fly fishing, diving, nature walks and slipway. Pine Lodge & Green Lodge exclusive for one or two. Spectacular sea views. Explore hills, glens & islands & return to comfort and peace. Spacious ground floor 2 bedroom apartment in a period building close to the town centre. Views across Oban bay. S.T.B. 4 Star 3-bedroomed cottage on Seil in the style of the original slaters cottages but with all mod cons, sleeps 6/7, sea views. Completely renovated croft house in Taynuilt, 12 miles from Oban. Equipped to a very high standard. Ample parking. 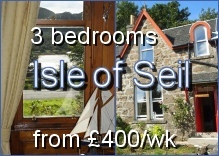 Two attractive cottages 6 miles from Oban, overlooking Loch Etive with access to the foreshore over the owner's land. Well furnished and fully equipped for 6 people. Restored cottage with open plan living area with kitchen, a double bedroom and a shower room. Bedlinen included. No dogs. Taynuilt village is on Loch Etive, 12 miles east of Oban. 2 & 3 bedroom chalets, well furnished and fully equipped for 4-6 people. Modern extension to the owners' cottage, with its own private entrance. Magnificent views over Loch Etive and Ben Cruachan. 2 bedrooms sleep 4 comfortably. The light and airy glass conservatory is accessible from the kitchen making it the perfect place to sit and enjoy breakfast. Comfortable, spacious south-facing 2-bed apartment in a handsome Victorian villa, with views through the large bay window over Oban and the islands beyond. 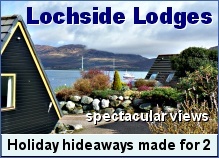 Midway between Oban and Glencoe, these modern chalets and caravans in a hillside setting enjoy a view of mountains and lochs. Two comfortable well equipped properties sharing a games room & badminton court. Half way between Oban and Fort William. 6 apartments converted from previous outhouses and servants quarters sleeping 2, 5 or 6, plus two luxury lodges for four people.